Are you in the mood to make some cute and fun DIY Christmas tree ideas? We’ve rounded-up 45 of the most amazing tutorials to help you do just that – all in the nick of time before Christmas, of course! From edible treats inspired by the festive tree, to ornaments, home decor, accessories and more – trust us, you’ll find all things related to Christmas tree crafts within this round-up! Alice and Lois have created these adorable fabric-covered Christmas tree ornaments, which you’re sure to love! What patterns and colors will you use? How great are these DIY Christmas tree cards from Blitsy? The best part? They’re kid-friendly, so you’ll want to make this project with the little ones! These DIY cinnamon stick ornaments are so unique – we love them! They’ll smell good too, so be sure to check out the full craft tutorial from Consumer Crafts. Here’s a cute Christmas tree project that you can eat! Cool Creativity has created these delicious meringues that the whole family will enjoy. Do you love to knit? Craft Bits will teach you how to make this DIY Christmas tree scarf. How clever! Who knew that some cardboard and yarn could make something this awesome? Easy Peasy Fun will show you how to make your very own cute Christmas trees. Easy Peasy and Fun has also created these super helpful Christmas tree bookmark corners to help you mark your page. Team these with a festive story for the ultimate end-of-year treat! Did you know that you can even turn pine cones into little Christmas tree ornaments? Elementary Art Fun has the full tutorial for you! Felt is a wonderful craft material and it can even be used to create some awesome Christmas projects. Hand On As We Grow created these button-adorned Xmas trees! Speaking of felt, here’s another craft DIY project, this time from Hello Wonderful. It’ll teach you how to make this awesome Christmas tree! With some ribbons, you too can create these amazing DIY Christmas tree hair clips. You’ll find this helpful tutorial via Hip Girl Clips! Green cardboard and colorful gemstones make some really pretty DIY Christmas trees! Housing a Forest is the creator of these kid-friendly crafts. Love washi tape? I Heart Arts n’ Crafts has created these DIY washi tape trees from cardboard and we have a feeling you’ll love decorating your house with these! Need a cute but inexpensive Christmas tree inspired craft project to keep the kids entertained? I Heart Crafty Things made these using paper plates – talk about clever! Here’s another delicious Christmas tree craft – and yes, it’s edible! I Heart Nap Time created these DIY Xmas trees from pretzels. Yum! Speaking of edible Christmas crafts – here’s another one, this time from It’s Always Autumn! These Christmas Oreo pops will be a treat at your end-of-year party. 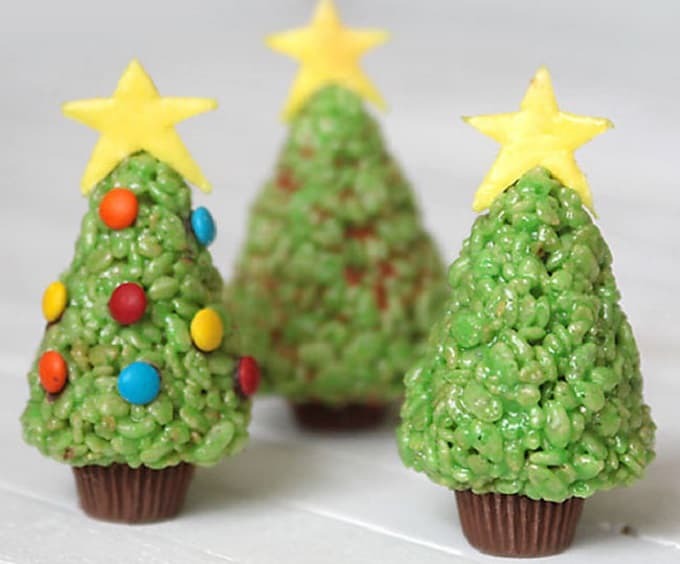 These easy Krispie Treat Christmas trees are going to make Christmas day even more delicious! It’s Always Autumn will show you how it’s done. This DIY felt Christmas tree garland is both cute and colorful! Want to make one for yourself? Be sure to check out the full tutorial from It’s Always Autumn! Here’s another edible Christmas tree treat! Kerry Cooks made these yummy, multi-colored cookies that both children and adults alike are going to love. Green waffles that look like Christmas trees? Count us in! Kids Activities Blog will give you the low-down on how you too can surprise your loved ones with these this festive season! How adorable is this DIY Christmas tree beanie? Little Red Window will tell you everything you need to know to make one for a little one in your own life! Martha Stewart has created these gorgeous evergreen Christmas trees from paper – they’ll decorate your home all year around if you want them to! We think they’re an elegant and modern Christmas adornment. Speaking of paper trees, how about this DIY Christmas tree garland from Minted? It’ll serve as the perfect backdrop to your dining table, or even as a gorgeous decoration to adorn your fireplace. Here’s a cute DIY felt Christmas tree that you can use to house a candy cane – what a wonderful gift idea from Mom On Time Out! Create an adorable mini Christmas scene in a glass terrarium by following these steps from My So Called Crafty Life. What cute things will you put in yours? You can also put a tiny Christmas tree in a glass globe and hang it on your own tree, just as No Biggie has done! These would also make perfect gifts too. These DIY Christmas tree hats are not just extremely fun to wear – they’re also very enjoyable to create too! Oh Happy Day has a great, step-by-step tutorial to help you achieve these. Speaking of Oh Happy Day, she’s also created these DIY Christmas tree place holders that you can put on your table for the big, festive feast! Guests will want to take these home as mementos of their fun day. With a few Popsicle sticks and your favorite craft items, you too can make these awesome DIY Christmas trees from One Little Project – hooray! Children will love this project too, so be sure to get them involved. Here’s another edible Christmas tree treat for you! One Little Project has made these festive brownies and we think they’re going to be real show-stoppers this holiday season. Bring Christmas into your place all year around, thanks to this DIY Christmas tree cushion cover by On Sutton Place! You could make it look even more festive by gluing colored pom poms on, or even adding tinsel to it. Wow, did you know that just a few colored paper straws could help you to achieve these awesome, DIY Christmas tree ornaments from Our Three Peas? You could make one for each member of your family! Which designs do you like the most – the cardboard Christmas trees, or the pipe cleaner varieties? Personally, we find it hard to choose, but we recommend you check out the full tutorial from Pink Stripey Socks to find out more! This DIY burlap Christmas tree bunting is divine! It looks like something you might spot in a high-end boutique, don’t you think? Plaid Online is the clever site behind this project. It’s another cute baby in a beautiful DIY Christmas tree beanie! Want the free pattern to recreate your own? You’ll have to head to Ravelry, pronto! Studio DIY loves bottle brush trees, so added a festive touch to hers with gold glitter – Divine! This is a simple and budget-friendly festive project. These DIY origami Christmas trees are about to take your festive décor to new heights! Sugar and Charm will walk you through the process. It’s just not a Christmas soiree without Christmas tree drink stirrers in your festive cocktails, is it? Thankfully, The Merry Thought has got you covered with this DIY tutorial! We love these DIY Christmas tree tassels and think they make a fun decoration alternative. The Party Teacher is the clever crafter behind this tutorial! You can also use some old toilet roll holders and turn them into merry little Christmas trees – isn’t that wonderful? Thanks to The Resourceful Mama for this clever tutorial! Wow, this DIY Christmas tree marquee light is the ideal centerpiece for the festive season. The Sweetest Occasion made this with her own two hands, so you won’t want to miss this tutorial! We had no idea that there were so many fun ways to mold a Christmas tree, nor that they could be so much fun! Trucset Bricolages will teach you these 9 unique methods. Wild Olive created this adorable DIY felt Christmas tree brooch and we have a feeling you’ll want to pin it on your lapel for the entire month! Who could resist that cute face? Pipe cleaners are one of our favorite craft materials, so imagine our delight at finding these DIY pipe cleaner Christmas trees from Zing Zing Tree! They’re even decorated with colorful pom poms. There you have it – 45 DIY cute Christmas tree crafts that you can make just in time for the festive season! Which projects were your favorites? We’d love to hear from you in the comments section below!